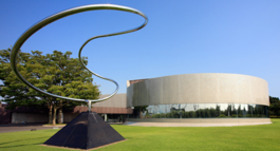 Hamamatsu Municipal Museum of Art is the first public art museum in the prefecture, and was opened to commemorate the 60th anniversary of Hamamatsu City. 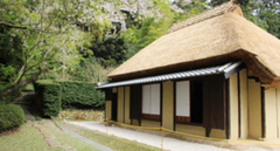 Located in a corner of Hamamatsu Castle Park, the art museum was opened near the Hamamatsu Castle Tower. 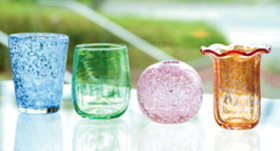 The featured pieces in the collection are 18th and 19th century traditional glass paintings as well as contemporary artists' glass paintings, which have made Hamamatsu Municipal Museum of Art well known as the "Glass Painting Art Museum. 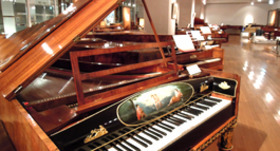 "There are currently 450 glass paintings in the collection (around 250 traditional pieces, around 200 contemporary pieces), making it one of the finest collections in the world.According to the years the pieces were painted, the glass paintings are separated into traditional glass paintings and contemporary glass paintings, with the traditional section being separated further according to place of origin: the West, China and Japan. 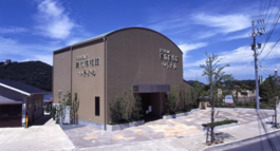 The majority of the traditional glass paintings were collected over many years by a Hamamatsu City doctor,　Rokurou Uchida (now deceased), and around the time the museum opened, the well curated collection was donated to Hamamatsu City. 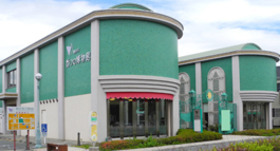 ※Elementary and junior high school students, seniors over 70 years old, and handicapped individuals are free of charge.